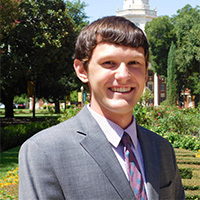 Jacob joined the Department of Political Science at Baylor in 2016. He has participated in study programs sponsored by the Hertog Foundation and the Intercollegiate Studies Institute, and was awarded the departmental award by both the History and Politics departments at Saint Vincent College. He also received funding for research in England from Saint Vincent’s A.J. Palumbo Student Research Endowment. Jacob’s academic interests include American political thought and intellectual history, the intersection of political philosophy and physical/human geography, the history of cartography, and classical political thought.